The Pembrokeshire COUNTY Wedding Fayre is dedicated to bringing you LOCAL Wedding exhibitors and services from Pembrokeshire and surrounding borders. 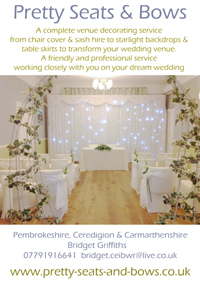 With over 100 Stands and growing, it is, without doubt, one of the largest Wedding Fayres in Wales. Our aim is to make your wedding day special and enable you to find all your Wedding requirements at one venue, saving you time and travelling, and offering you a huge choice and variety of wedding exhibitors to enhance your special day. Withybush Showground, Haverfordwest.-11am to 4pm, Admission and Parking is FREE. Pembrokeshire COUNTY Wedding Fayre hold a Spring and Autumn Wedding Fayre at the Withybush Showground. It is easy to find with plenty of FREE parking, FREE admission , and the atmosphere is always welcoming. We hope to see you there, you wont be dissappointed.